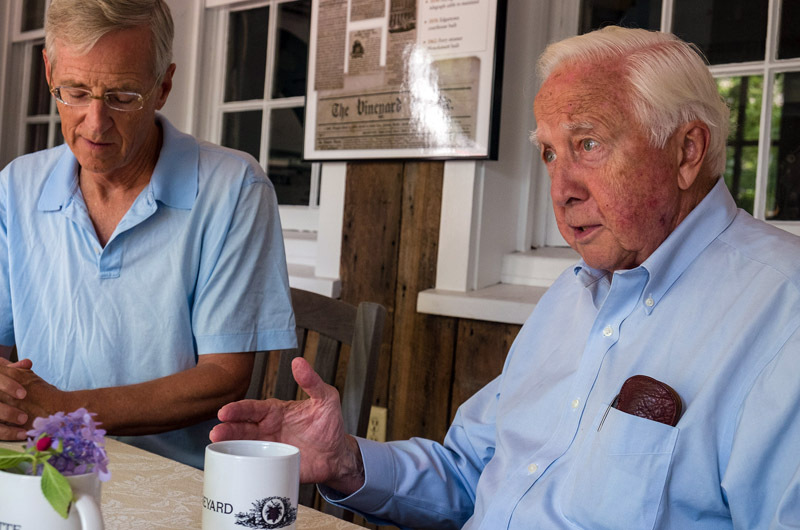 Two presidential scholars — Evan Thomas and David McCullough — discuss politics and the 2016 race at the Gazette office last week. With the Republican National Convention recently concluded in Cleveland, and the Democratic National Convention still under way in Philadelphia, the Gazette invited two presidential historians with long Martha’s Vineyard ties, David McCullough and Evan Thomas, to air their perspectives on the current race. 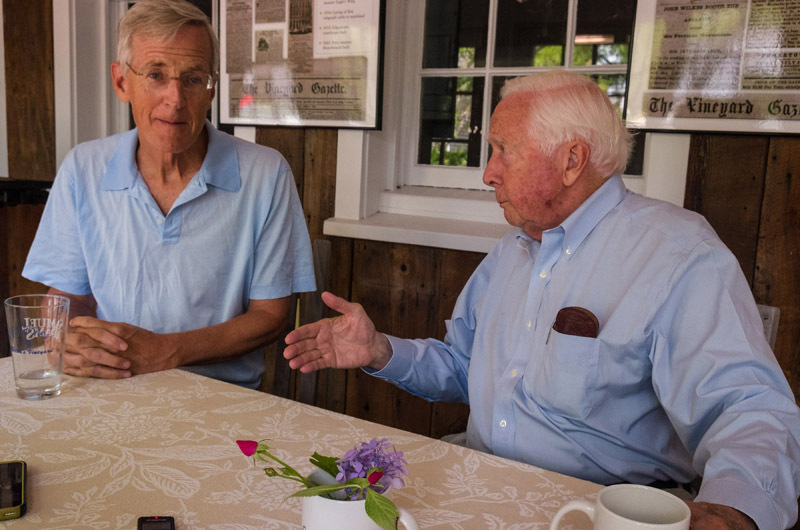 What follows is an edited transcript of their conversation, which took place at the newspaper office in Edgartown with publisher Jane Seagrave. 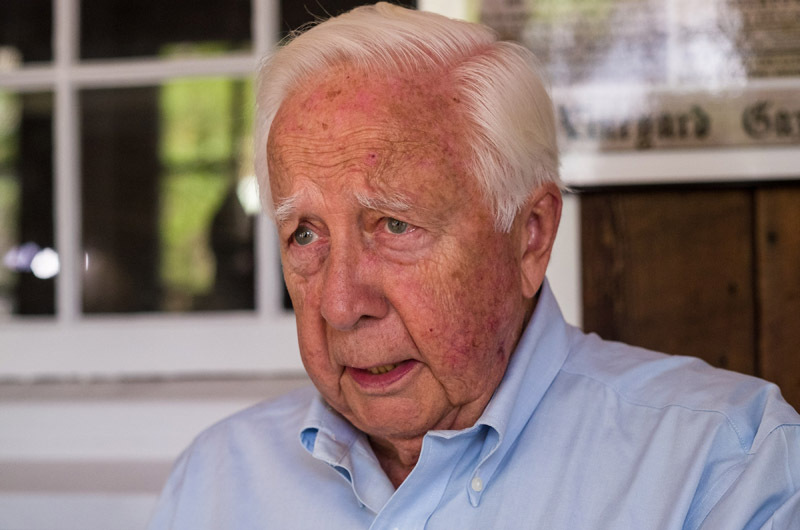 David McCullough: Well, how about last night. What’d you think? Evan Thomas: I was inspired. It made me feel better about a bad moment. I thought Obama was impressive, and I’m all for Tim Kaine, I thought that was heartening. What about you? Mr. McCullough: I thought President Obama’s speech was a landmark presidential address. It was right up there with the best of Kennedy. He has authority without braggadocio, and the fact that he is such a gentleman, through and through, came across. What particularly affected me was that this was happening in Philadelphia, and the presence of the Founders, no matter how little or how much you know about all that, was something to be felt. Even in the gloss and shininess of all of that present-day television hoopla, I think of Carpenter’s Hall, where the first Congress met. The Founders weren’t perfect as human beings individually, but they were geniuses, and they left us these inspiring and inspired documents of aspiration that we succeeding generations have to fulfill. Mr. Thomas: I was struck by Obama’s grace — and his gray hair. He made a joke about it, kind of a sweet joke, that Michelle hasn’t aged a day, but the pressures of the office have been great on him. Being a president in any time in our history has been brutal. But in our age when things happen instantaneously, where you’re assaulted on all sides by threats real or imagined, it’s just a very tough spot. Mr. McCullough: And weights and pressures we don’t even know about. I would happily vote for him again, give him a third term. I know that’s unrealistic, but I would. I just think history is going to give him far higher marks than we are presently. Mr. Thomas: I was reminded of a book that I read by an old colleague named Dan Klaidman about the secret war, the drone war. I hadn’t realized the degree to which the president sits there in secret, with his national security advisors, choosing targets, deciding who’s going to live and who’s going to die. These are unbelievably difficult decisions, made in secret. The president is well advised, but at the end of the day, it’s his call. The president of the United States, any president, every day, is confronted with things that we don’t know about, things that make his hair turn gray, keep him awake, affect his family life. It’s just an unbelievable cauldron that we throw these men — and possibly woman — into. And we’ve got to remember that. Mr. McCullough: Harry Truman said you have to let the dust settle, and I think it takes about 50 years, before we can really judge a president. Many of these men who have been ridiculed or looked upon askance, in retrospect are looking better and better. Eisenhower, for example. Eisenhower was a superb president. He served his country virtually his whole life. He was highly intelligent. He had a strong sense of history and a strong sense of duty. He said some things about leadership that I wish were better known. What’s called for in a leader. Number one is character. Experience. Ability. And responsibility. The fact that he did not go to war in Viet Nam. You have to look at what the presidents didn’t do as well as what they did do. The fact that John Adams did not go to war with France was one of the best decisions that any president ever made. Mr. Thomas: Ike had one great quality — just to follow up on what David is saying — that really struck me. And it’s what I call a confidence to be humble. Eisenhower had an enormous ego, but he knew how to control it, to hide his ego. He’d like to say that he got ahead by being underestimated. He consciously used this as a tactic, but it was intrinsic to who he was. This innate modesty that came from his Kansas roots, and his upbringing, real strict religious upbringing, and his training at West Point, forged the kind of character that allowed him to be confident and humble. Mr. McCullough: And we are talking about a Republican. The idea that the party of Abraham Lincoln has nominated this totally unhinged man, Donald Trump: Unacceptable, unqualified and uninterested in knowing more than he already knows, which is virtually nothing. I find that one of the most maddening qualities about the man. He said the other day that he doesn’t read books, doesn’t care about books, never has, because he has this instinctive, intuitive knowledge that carries him so far. And when he was asked if he’d ever read a book about the presidency, or a presidential biography, he said no. And he didn’t seem the least bit bothered by that, or understand why he would be asked that question. I think every single notable president we’ve had has been a student of history or was in fact a historian himself. Theodore Roosevelt, to use another Republican example, started writing his book on the War of 1812 when he was still at Harvard. Eisenhower’s book, Crusade in Europe, was an absolutely marvelous book, which he wrote himself. He had this kind of halting way of speaking, but when he sat down to write, he could really write. And obviously, Kennedy, Woodrow Wilson, all were historians in their way. And, even though the biography that George W. Bush wrote about his father was very partial to him, it’s a superb book. And I know that both Bush Sr. and Jr. are real readers of history, still, all the time. Mr. Thomas: I’m asked sometimes to compare Trump to Nixon, because I wrote a book about Nixon, and there are some, similarities, for better or for worse. They both were good at exploiting fear. They both were sensitive to the feelings of outsiders, and able to play on that. The biggest difference is that Nixon knew a lot. Trump doesn’t know anything, at least as far as I can tell. With Trump it’s always hard to know what he really knows and what he doesn’t, because so much of it is a hard-to-decipher game. But to David’s point, Nixon read all the time — partly because he didn’t like talking to people. He was constantly reading. Mr. McCullough: Harry Truman said the only new thing about the world is the history you don’t know. And when you have a presidential aspirant who doesn’t know any history, and everything is new to him, he doesn’t know how to handle it. History is about cause and effect. It’s about people. It’s about responsibility. Donald Trump is totally irresponsible because he doesn’t know what he’s saying and he doesn’t care if he doesn’t know what he’s saying. Having just spent so much time with the Wright Brothers, I can’t help but think, why would we want to put somebody in the pilot seat, who has never flown a plane, who has no idea where he’s going, and doesn’t seem to understand what uncertain weather we’re living in right now? It’s terrifying! Mr. Thomas: It is terrifying, but one of the good things about reading history is that you are reminded that however bad things seem now, they were pretty bad in other times. Mr. McCullough: Oh, they were often worse. Mr. Thomas: I went to the 1968 Democratic Convention. There wasn’t just a little demonstration in the halls, they were seizing the city and having a police riot. But I want to remember this because I think and I hope, that if Trump is elected, our system is still pretty resilient. I think it was Harry Truman who said, Eisenhower is going to get elected, and he’s going to get in here and start pushing all of these buttons and nothing’s going to happen. Because it just doesn’t work that way. The president is limited. Now, this is a source of frustration to a lot of presidents, and they’ve abused power because of it, but there’s something that’s pretty healthy about a system that stops presidents from doing anything they jolly well please. I may be overly optimistic about this, but we have a long history of our being a government of laws and not men, and when executives abuse their power, one way or another, the system catches them. This was true in the case of Richard Nixon, but it’s been true all through our history. You don’t look persuaded, David. Mr. McCullough: No. Because I think of that button that he could push, and that’s not going to be decided by Congress. That’s not going to be decided by the cabinet, or the Supreme Court. The presidency now involves such power — individual power. Instantaneous, individual power. I think the prospect that Hillary Clinton may be the first woman ever to be inaugurated president of the United States, is a thrilling historic landmark. The fact is she has that grit, that resilience to constant abuse, ridicule, criticism. Who has had the experience she’s had, and who has the abilities she has, the intelligence she has? I can’t say that I think she’s ideal, but nobody is ideal. And if anything, experience is maybe the utmost important qualification of all. Does she know how to fly the plane? And has she flown a plane in bad weather. And is her background one that shows that she has the stamina to withstand defeat, criticism, ridicule, all the rest? I’ve written a number of books, and I am at a stage in my working life where I’m looking back at what I’ve done. If there’s a pattern, it’s [that I’ve written] about people who do not give up, who know how to handle defeat. Who know how to handle criticism and setbacks and embarrassments. Washington in 1776 had one defeat, one mistake that he made after another but would not give up. And he had the capacity to inspire those working and fighting with him to keep going. Harry Truman was being told by everybody he couldn’t possibly win in 1948. The Wright Brothers crashed, again and again, and they were ridiculed by people, and they were thought as a couple of wackos, but they would not give up and they always learned from their mistakes. I think if we were to elect Donald Trump president of the United States, it would be one of the greatest mistakes ever made, not just by our country but by any nation ever. Mr. Thomas: I hear everything that David says about this, but often, we don’t really find out character till the person is in the office. Mr. McCullough: Is that a risk you would want to see our country take? Mr. Thomas: No, not with Trump. I’m actually really talking about Hillary. With Hillary, I want to believe that she’s learned from these experiences. And that she has the grit. But Hillary does have a bit of a chip on her shoulder, and she has — she’s not Nixon — but she has some Nixonian aspects, of brooding, of seeing that she’s surrounded by enemies. I’m hoping, that through experience and through character that she’s outgrown that, and that if she becomes president she will rise above that side of her and use her experience to do great things. Mr. McCullough: She’s been auditioning for the role for a long time. And this clown who has come on stage is an evil clown. He really is. He’s a bigot, he’s selfish, and extreme, he’s interested in only himself, and money. Period. Is that what we want? Is that what we want to be the leader of our country? Mr. Thomas: Maybe I’m naive, but I just don’t think our country’s going to elect him. At the end of the day, they’re going to see this. Mr. McCullough: I think you’re right. But I don’t think we can stand by and count on that. I’ve never taken a public side in an election. I felt as a historian that wasn’t my role. And when I was asked at the end of talks, or interviews, how do you feel about this present political situation or the present election? I’ve always said, “My specialty is dead politicians.” And that gets a laugh, and I can move on. But I can’t do that anymore. I can’t stand by and watch. Mr. Thomas: The Republicans before he gave the speech were saying, he’s going to be talking about, or reprising Nixon’s 1968 speech. Actually it was not! Nixon did strike some of those notes, of exploiting fear — crime in the streets. But if you actually read Nixon’s speech, it was a call for unity. It was a very different speech. I don’t want to stand here as Nixon’s great defender, but on this one, Nixon’s getting a bum rap. His speech was a lot kinder and gentler than Trump’s by far. Mr. McCullough: I’d love to hear more about how you would bring Nixon’s virtues to front and center stage, along with the fact that his inaugural address was not a sermon on fear. What else did we not give Nixon credit for? Mr. Thomas: He did things. You look at his record. Now, he did it for political and expedient reasons, but he accomplished a lot for the environment. He created the EPA. He passed and supported fairly vigorous clean air and clean water standards. He ended the draft. The 18-year-old vote. He expanded the welfare state. Why? Because he was a politician. He wanted to get elected. He desegregated the public schools of the deep South. He didn’t get any credit for it, because of a lot of his rhetoric was awful. But while he was blowing off steam by scaring people, he was quietly getting things done. Now, ultimately he destroyed himself because he didn’t have the character that we’re talking about. He was his own worst enemy. But we shouldn’t forget that he accomplished a lot because he actually believed in government, and he used politics for his own ambition, for his own advancement, that’s true, but also to serve the country. Mr. McCullough: I think a lot of us, when we think what did he do that was positive, was that he opened up relations with China. Mr. Thomas: I was talking about domestic things, but David’s right, that’s his single biggest accomplishment. And not just that, he negotiated, personally, the first-ever arms control treaty. He believed you had to deal with your enemies. Mr. McCullough: One of my favorite moments in the life and times of Harry Truman took place in a private meeting in the president’s office, when he was about to appoint General [George] Marshall secretary of state. And one of his political advisors, almost certainly Clark Clifford, said, Mr. President, you might want to think twice about that. And Truman said, well why is that? And he said, because if you appoint General Marshall secretary of state, in three or four months, maybe less, people will start saying, “He’d make a better president than you!” And Truman said, he would make a better president than I am . . . but I’m the president, and I want the best possible people around me. And the fact that he had some people like Dean Acheson, and General Marshall around him, and some others, was the mark of someone who wanted to bring in the best possible talent. I think that’s an area where Mrs. Clinton would score quite well. Whereas I would lie awake at night with horror in my imagination of what kind of people would Donald Trump be bringing in. Mr. Thomas: But again, the system catches the bad actors. Remember Ollie North? Reagan got impatient with the bureaucracy . . . and so he had this marine colonel who went around the bureaucracy, but he got caught. All those checks and balances the founders put in were put in for a reason. I love it that John Adams, David’s hero John Adams, understood that men and women are vainglorious and jealous . . . and self-promotional. And because that’s the way we are, we have to have a system of government that protects us from ourselves. Mr. McCullough: Yes. Adams to his everlasting credit was the only Founding Father that never owned a slave. The only one. And out of principle. And if anything, his wife, Abigail was even more adamant on the subject. And he never gave up on that. It’s that never giving up . . . . I keep waiting for that moment in the McCarthy hearings, when the lawyer for the Army, Joseph Welsh, turned to [Sen. Joseph] McCarthy and said, “Have you at last no decency, sir?” And who knows, there may be a moment in the debates to come, or there may be a moment when somebody turns, somebody of importance turns and says that to Donald Trump. Because that’s the essence of it: he’s indecent! Mr. Thomas: Hillary’s going to have that moment, I think, in the debates. Trump is so outrageous, I suspect he’s going to give Hillary the opportunity on a platter to play the Joseph Welsh moment. Trump and others have normalized lying. It’s become accepted. The more you do it, the more accepted it gets. I cling to this notion that in the long-run you can’t . . .
Mr. McCullough: Get away with it. Mr. Thomas: Eventually it’s going to catch up. Mr. McCullough: Who would you say was the closest that we’ve ever had to Trump? Would it be Wallace, George Wallace? Mr. Thomas: We’ve had a long tradition of angry populists — Father Coughlin, Huey Long — who scare people under the guise of being for the little people and are actually about making themselves rich and famous. Our system has always rejected them ultimately. You just mentioned Joe McCarthy. They can get pretty far, but eventually they destroy themselves. I have faith in that. Maybe it’s naive faith, but that has been our history. Mr. McCullough: I think working in history as you and I do increases your faith, increases your optimism. One of the most obvious of all the lessons of history is that nothing of consequence was ever accomplished alone. It isn’t done by one new president. It isn’t done by one imaginative and inspiring leader. You have to work together. And that’s what the founders understood. You have to work together. You cannot have the attitude that if that delegate, that senator, that president is against what I stand for or what I want to see accomplished, then he’s my enemy. Because you have to work with that same person the next week or the next month. Mr. Thomas: That’s still true. I mean God forbid, if he gets elected, Trump’s not going to be able to get anything done unless he works with other people. That’s still true. Richard Nixon made a lot of deals. He believed in compromise. That’s why he was actually pretty effective. Mr. McCullough: We’ve been through rough times, again and again and again, and when I hear some people on talk shows, say, “Oh you have to realize that was a simpler time.” No it was not, there never was a simpler time. Because they had to deal with adversities that we don’t even think about, like . . . smallpox, let’s say. Or diphtheria, or typhoid. When John Adams was serving as a vice president, overseeing meetings of Congress, they went at each other with their fists. One man had a fire tong that he was beating the other one with. There’s nothing new about this. But it can’t be allowed to become acceptable. I think John Quincy Adams is one of the most underrated leaders we’ve ever had, but what I liked best about him is that after he served as President and did not win re-election, he then served in the Congress, and that was his heroic time. And he was indefatigable. He battled to his dying day to do something about slavery. Mr. Thomas: Maybe he’s a model for Obama. Not that Obama would run for the House, but he’s a young man. Obama is fantastic on race, I hope as a retirement act he gets himself deeply involved in this national debate, as a public intellectual trying to engage people about race, to wade into this messy, difficult subject that’s tormenting us and tearing us apart. Mr. McCullough: People say, “How do you feel about the country, where we’re going?” I’m very optimistic. I know that there are huge problems, and certain people assuming roles that they’re unqualified for. But last year, 2015, I was in 26 different states, lecturing or talking about my Wright Brothers book. And everywhere I went, people were talking about something that they were doing in their community, their city, their section of the state, that they were excited about, proud of, and rightfully so. And they were optimistic about what was going on. David Brooks the other day, in one of his columns, used the expression the “American Project”—and I thought: that’s exactly right. [The Founders] told us, they remind us, nothing of consequence is ever accomplished alone. Donald Trump always talks about how he’s the only one involved, he’s the only one that’s going to figure it all out, he’s the only one who is going to work the miracles. And he doesn’t know what he’s talking about. When what we need to be told is that we have to work together, and that’s how this country has been built. That’s how we’ve evolved out of these problems that we’ve had. 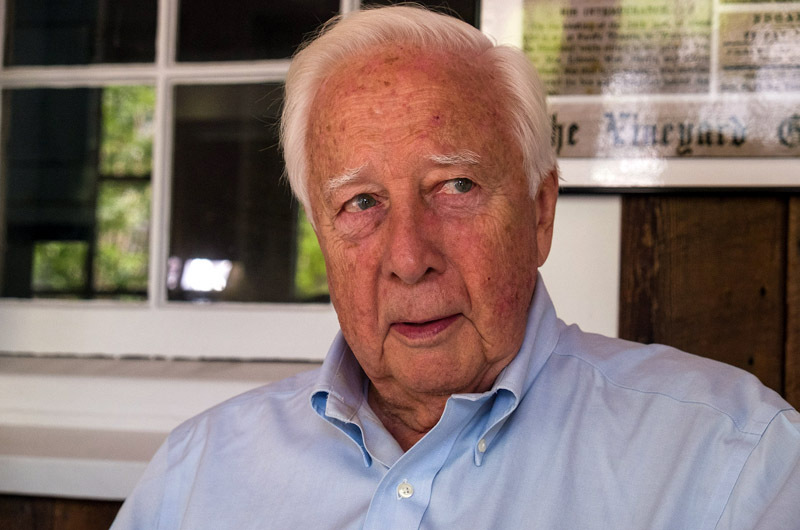 David McCullough has twice won the Pulitzer Prize for presidential biographies, one on John Adams and one on Harry S. Truman. He has also written eight other books, including most recently The Wright Brothers, about the early days of flight. His many honors include the Presidential Medal of Freedom, which he was awarded by President George W. Bush in 2006. 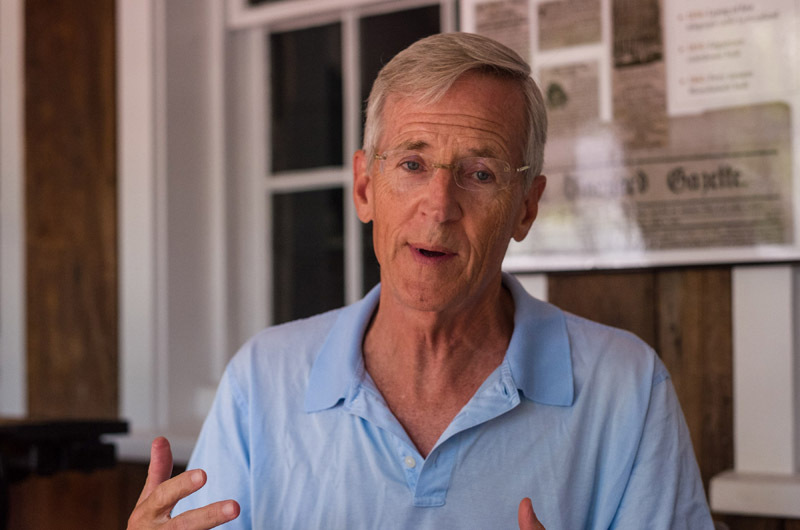 He has long owned a home in West Tisbury. 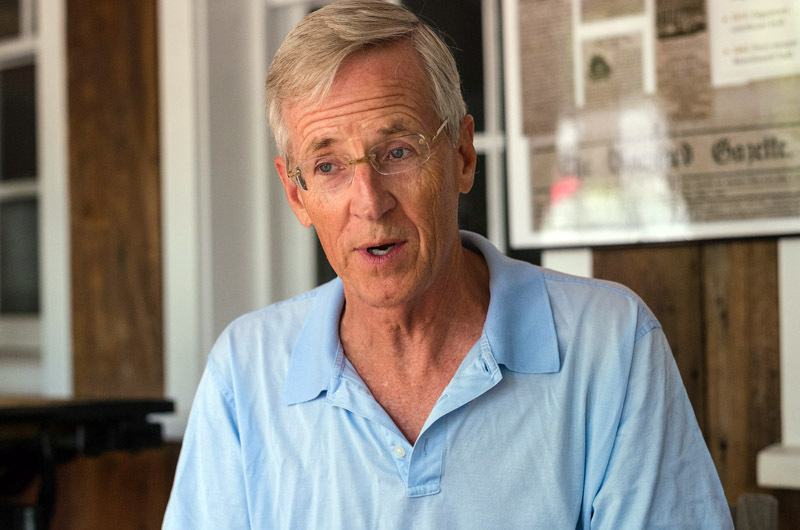 Evan Thomas is a journalist and author of nine books, including his most recent volume, Being Nixon. 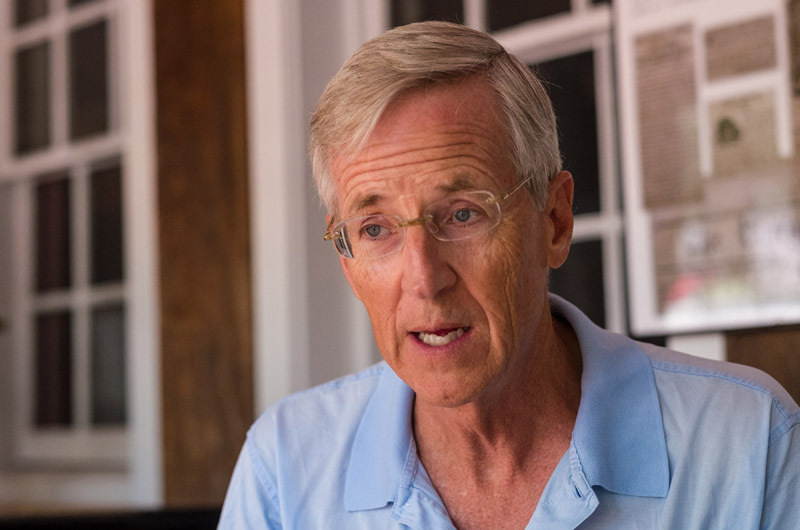 He worked for more than 30 years as a reporter and editor for Time and Newsweek magazines, including 10 years as Washington bureau chief for Newsweek. He is currently working on an authorized biography of retired Supreme Court Justice Sandra Day O’Connor. For many years he had a home in Edgartown. A great piece and scoop for the Gazette. It deserves the widest circulation in that these two leading American writers, scholars and historians (with deep Vineyard ties) have placed the current election in the context of presidential history. Also, they compare Donald Trump so unfavorably with many other presidents and find it necessary to make clear their own views that he is totally unqualified to serve as president of the United States. Bravo to them and the Gazette! Thank you gentlemen for allowing us to listen in on such a thoughtful, well-informed and measured conversation on the current political landscape. The historical perspective of two esteemed and qualified writers was a welcome change from the endless belligerence and bloviating we are subjected to on a daily basis. And thank you Vineyard Gazette for providing a pleasant respite from the media circus that we have all had to endure for far too long. These men and this very substantive conversation again remind us of why the Vineyard is so special! A liberal lovefest! Let's keep it balanced. I think it was fair, but it was their opinions, so take that as you will. Republicans call anyone who opposes their views "liberals", whether it applies or not, because it makes them sound too compromising. Democrats call everyone "racists" whether they are or not because it makes them sound evil. In reality most of us are in the middle ground and I think these two writers tend to be there as well. This is the best discourse I have read on our current predicament. It made me both fearful and hopeful, at once. The only problem is that Trump will now brag that he is the only politician David McCullough will discuss who isn't dead. Nixon not only read books, he often watched westerns. I once had the pleasure, many years ago, of sitting in a small puddle jumper flying to Hyannis and was delighted to share a conversation with Mr. McCullough. I complimented him on his fame and love of history. He was aware of the tree I had planted on the corner of Music St and said I was "locally famous". Such a gracious thought. His description of Trump as "indecent" is indeed accurate but I would call the man "unfinished." Trump strikes me as perpetually unfinished, a totally unmade man out of focus and unaware of the good that is possible in the world. It's nice to hear your comments, especially here Georgia. This made me throw up and could not read anymore slanted one way thinking. Once again the leftest rag sheet of the island shows its colors. Hard for any republican to get fair coverage anywhere in America today, why should it be different here. After the puff peace on Hillary last week we get this crap. Why not list all the extremely true deficiencies of Clinton in an article. I'm disappointed there was no discussion about Senator Bernie Sanders. I would like to hear their thoughts on his integrity, knowledge of history and political experience. Thank you for your insights gentlemen! I wish we could get your words/views out to the general populous this election year, make them pause and actually think. Very interesting dialogue. My family has been involved with presidential campaigns since FDR's first run in 1932 so I appreciate these two perspectives. I was at the 1968 Democratic convention in Chicago as a delegate while my peers were demonstrating outside the hall. I was in Atlanta in 1988 when Mike Dukakis helped launch Bill Clinton into the national political spotlight. I agree that Donald Trump is a scary candidate playing on fear. 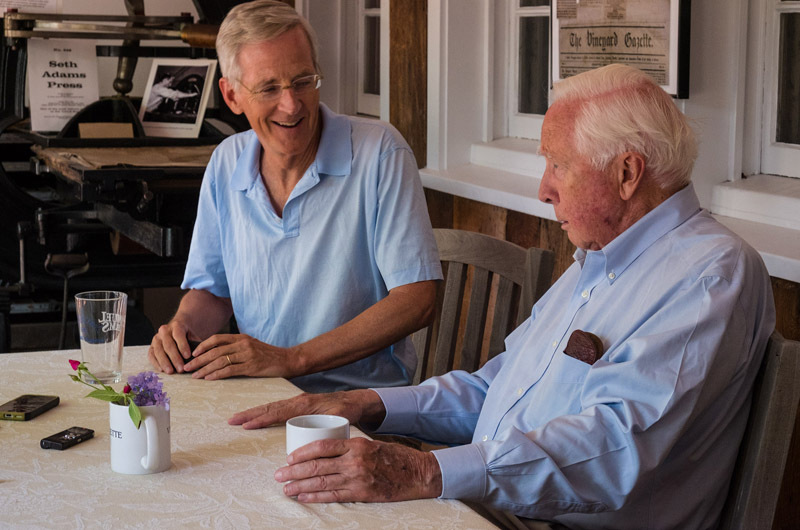 I have great respect for David McCullough and have enjoyed reading many of his books. He inspired me to become a self- made historian like him and author many books myself. I don't know Evan Thomas. But the way these guys pick and choose their history to make their points is shameful. They should have internalized Shelby Foote's great insight - "The truth is the facts we love". Thanks to the Gazette for sponsoring the interviews and for publishing them as well. To Bob from Edgartown, I'm sorry that you cannot read a rational and objective piece without exploding into vituperation and the rants that characterized the Republican National Convention and Donald Trump's speeches over the past months. So far no one has addressed some critical issues such as climate change (Trump denies it), or whose hand you would like to see wavering over the critical codes, war plan, and nuclear button. As was noted, Mrs. Clinton is not ideal (I'm still a Bernie fan but voting for Clinton) but at least she is intelligent, compassionate, rational and can focus on issues for more than 30 seconds at a time. Further, I have never heard her say "I alone" can solve problems which is a comment straight from Mr. Trump. How about women's rights, reproductive issues, civil rights, more money for education and, yes, even for medical research into critical issues such as cancer, or how about arthritis (and tick borne diseases)? There are so many issues and Trump, "frankly, doesn't have a clue, period!" Everyone must remember that they have one inalienable right and that is at the ballot box, so get out and vote! If you vote for Trump be careful what you wish for because the rest of us value our country, our families, our environment and a future. This is the first election when I am starting to worry that with Trump we won't have a future. 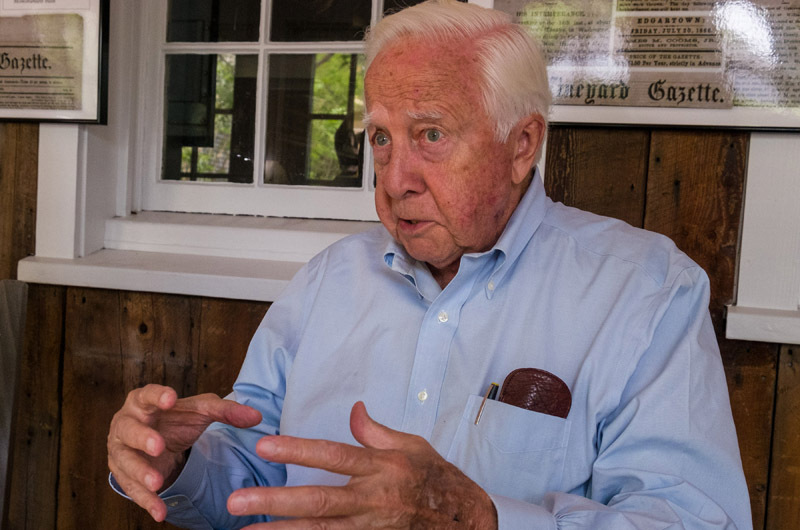 David McCullough should have run for President, the world would have been a much better place, fun to think about . Wish I knew what was going to happen to all of us. Thank you Gazette. A very enlightening conversation. Thank you to both gentlemen. On Mr. Thomas's comment that Nixon "passed and supported fairly vigorous clean air and clean water standards" it's worth making one point: Nixon actually vetoed the Clean Water Act of 1972, (as Eisenhower had done of an earlier version). It was passed by an overwhelmingly bi-partisan congressional override. By today's science-denying standards Nixon's environmental record is still impressive, but in the case of the Clean Water Act what seems missing from today's politics is not so much presidential leadership than a functioning and responsible legislature. This article shows elitist arrogance and a false sense of intelligence. Yes Trump is shallow and low vocabulary but to suggest that the best qualifications for the presidency is to read books is laughable. How about these great knowledgable readers who left us 20 trillion in debt, one nation two cultures, an impoverished underclass and by any metric a social pathology of crime drugs,dependence,illegitimacy. Need I go on. The arrogance s stunning. McCollough should stick to writing. Just a reminder to those reflecting on the election. There is difference between thinking and reacting.